The Recorded Sound Archives has been granted specific permission to play/stream some copyrighted recordings on this website. Due to copyright restrictions, the recordings on this site cannot be downloaded. Recordings restricted by copyright will only play 45 seconds to give you a sense of what that recording originally sounded like. These recordings can be identified by an icon & the words (RESEARCH STATION) in the music player. 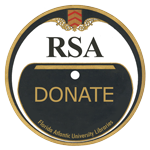 While these recordings are restricted to 45 seconds on the public website, full access is available through the RSA's Research Station and may be accessed only for bona fide academic study. FAU Students, Faculty and Staff can listen to recordings unrestricted by logging into the Research Station using their FAU ID. If you are not part of the FAU community and interested in gaining access, you may apply by visiting Research Station in the top menu. If you own copyright to material available on this site and would like it to be removed or made publicly accessible, please contact us.